SANTOS: He's 'the king', renowned as football's greatest ever and the icon of Brazilian World Cup success. But with the tournament finally back in his home country, it seems somebody forgot to invite Pele. At the opening ceremony in Sao Paulo, attended by President Dilma Rousseff and a clutch of visiting heads of state, Pele was a notable absentee despite living not far away in Santos. For Brazil's second game in Fortaleza, the three-time World Cup winner was not only not at the game -- he was in his car, stuck in Brazil's notorious traffic near Sao Paulo. "It was the second time I heard a Brazil World Cup match on the radio... in 1950 and today," he told Globo television later, referring to when Brazil first hosted the World Cup. Brazil is not short of successful ex-players. But Pele, 73, was named an honorary ambassador in the build-up to the World Cup and has an unmatchable following abroad. Last week, a museum celebrating his life was unveiled in port city Santos, where Pele played his club football. "O Rei" (the king) cried freely at its inauguration. However, at the World Cup his appearances have mainly been restricted to TV advertisements for supermarkets, fast food and shampoo at half-time. Rather than Pele, Brazilian supermodel Gisele Bundchen is tipped as the personality most likely to hand over the trophy at the July 13 final in Rio de Janeiro. It is a surprising demotion for a man named "athlete of the century" by France's L'Equipe sports magazine and who is feted the world over. For some fans, it seems a little odd. "I think it's strange," said Rodrigo Andrade, 27, a pastor from Sao Paulo who was visiting the newly opened Pele museum in Santos's cobbled historic quarter. "I think all the people who came from outside of Brazil for the World Cup want to see Pele." Pele was not available for comment, and his publicity team did not offer any explanations following requests from AFP. 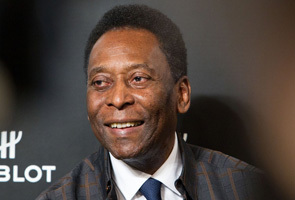 Guilherme Guarche, historian at Santos FC's Memorial das Conquistas, the club museum, suggested that Pele had fallen out with football's world governing body FIFA. "It depends on the conversation between Pele and FIFA. We don't know what happened between them, why he didn't show up. It's FIFA business," he said. But journalist and historian Marcos Guterman said Pele's image has steadily diminished in Brazil, which is in the midst of great social upheaval. "People here don't take him as seriously as foreigners," said Guterman, author of "Football Explains Brazil - a History of the biggest popular expression of the country". "Pele is a symbol of a great era for Brazilian soccer but he's part of the past." Guterman added: "There are many other soccer players that are more important than Pele, for example Socrates. His opinions were very important to us because he was politically engaged here in Brazil. "Pele wasn't. He's sympathetic to the government, whatever government it is. He speaks for the government, including the dictatorship. So we don't take his political opinions seriously." Last year Pele misjudged the public mood when he criticised protests against Brazil's inequality and lack of basic services during the Confederations Cup. "It was embarrassing... he was very unpopular because of that opinion and of course people don't forget that," Guterman said. "Pele stands for nothing more than memory from the past, he's not important for us now," he added. "When he speaks about politics or economic issues, almost every time it's disastrous. It's shocking but it's the truth." Jose Paulo Florenzano, an anthropologist and soccer expert at Sao Paulo's Pontifical Catholic University, agrees that Pele is out of favour with Brazil's media and progressives. Nevertheless, he said it was "too strange... that he's missing from all this spectacle". "If Brazil goes forward in this tournament, at some moment Pele will appear in the stadium," he said. "But for me, this doesn't change the situation that we've noticed." He said many people in Brazil were ambivalent about Pele, who was born Edson Arantes do Nascimento in 1940 and scored 1,281 goals in 1,363 games, according to FIFA. Often Brazilians, when asked to name football's greatest player, will say Garrincha, the "Joy of the People" whose dribbling skills and goals have attained almost mythic status. For Pele, listening to Brazil's game in his car, there is a circularity with 1950, when his country first hosted the World Cup and he tuned in on the radio aged nine. He will hope that Brazil will fare better than 64 years ago, when they were stunned 2-1 by Uruguay in the decisive match. And many will be watching to see if Pele steps off the sidelines before the current tournament is over.